Joining Arun for a dayhike on Roundtop seemed like too much driving for too little climbing, so I camped an extra night just outside the Carson Pass Sno-Park and dayhiked a peak with my name on it (6 hours) before driving home. Fierce winds made an otherwise straightforward hike somewhat challenging, but I was pleasantly surprised by the quality views on these peaks! I started at Meiss Meadow, the Sno-Park just west of the main Carson Pass Sno-Park, just to say I had. Most people don't know it's there, and it's often full of party busses or RVs or large groups since it's slightly off the highway. See the Carson Pass trailhead page for waypoints and general location. 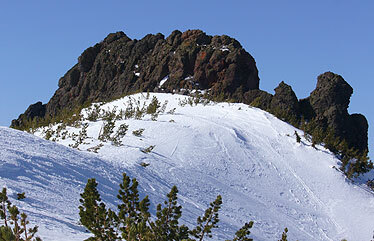 Since the route was mostly snow, I basically followed Red Lake Peak's south ridge. The peak has a marked summit (waypoint REDLKP) that doesn't seem to be the high point (REDLKH) where the register lives next to a wooden sign. Further south than the map's peak label there is another interesting false summit with use trails indicating people climb that one also. I climbed all three just to be sure! There are short stretches of Class 3 on each summit, but the rock is solid with lots of large 'chicken head' holds. The easiest route to the high point seems to be straight up to the ridge about 100' south of the high point. Aim for a lonely looking small bush or follow your GPS. It's not real obvious! Continuing north from Red Lake Peak (traversing just below the summit block on the east side of the ridge) I had some steep crusty snow on the way down to a saddle. No glissading today! The wind was now howling intensely enough to blow my ice axe more than 45 degrees away from vertical when I let it pivot in my hand. From the saddle (waypoint STPSAD) to the summit of Stevens Peak (waypoint STEVSP) I was mostly on rock and dirt. The snow had blown off long ago, leaving patches of water ice and some drifts behind rocks or plants. Once again, the high point of the peak (waypoint STEVSH) was not the place marked as the summit on the map (waypoint STEVSP). Going beyond the named point to the high point is an easy stroll on level ground, and reveals a stunning overlook of Hope Valley. I was the first of the year to sign the register. Others may have been there before me but been unable to find the container in the snow. By the time I got there, the snow was basically blown and sublimated off the summit area. This peak looks, on the map, like it would have similar views to Red Lake Peak, but once you're there it feels like you're leaning out into the valley. Picket, Hawkins, Freel, Jobs, Round Top, Thunder, every peak in the area is easy to pick out from Stevens. Very nice... but given the increasing lenticular clouds, I beat a hasty retreat. Red Lake Peak's summit block from the north. 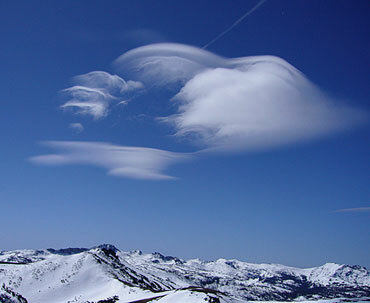 Lenticular cloud near Steven's Peak, demonstrating very high wind speed. Map of my route (red going up, blue coming back).